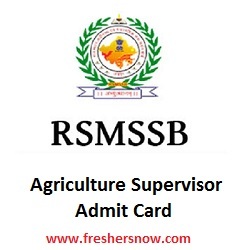 RSMSSB Agriculture Supervisor Admit Card 2019 is Available Now. Rajasthan SMSSB Agriculture Supervisor Admit Card 2019 is released on 27th February 2019. Moreover, the higher authorities of Rajasthan Subordinate and Ministerial Services Selection Board decided to conduct the examination on 3rd March 2019. There are 1832 vacant positions in Rajasthan. All the eligible candidates can download the RSMSSB AS hall ticket 2019 from the official website rsmssb.rajasthan.gov.in or from our page using the link provided below. Observe the table give above for the detailed information about the exam dates, admit card release date, job location and other details. The official website link is also provided on this page. Refer to the further sections for the complete details. This section gives you complete details about the exam dates and the selection process for the examination. The higher authorities are planning to conduct the examination on 3rd March 2019. Moreover, the admit card is very important for the exam, as the Admit Card is issued on 27th February 2019. The selection process contains a written test. Candidates who meet the eligibility criteria will get the admit cards. After downloading the admit card, candidates should attend the exam. The candidates who score more than the qualifying mark will be qualified for the next rounds. The rsmssb.rajasthan.gov.in Agriculture Supervisor Hall Ticket 2019 contains the overall details about the candidate. So, after downloading the hall ticket, go through it. If you find any mistake, then get it resolved soon. The details present on the hall ticket are in the following manner. Additional to the RSMSSB AS Hall ticket 2019, candidates should also carry the identity proofs for the examination. Aspirants without the identification card or any proofs issued by the government are not allowed for the examination. Therefore, candidates should carry any of the mandatory documents to the venue. The mandatory documents include aadhar card, voter id and so on. Note down the documents mentioned below and recheck them once again before attending the exam. Aspirants who are ready to appear for the RSMSSB Agriculture Supervisor Examination 2019 should go through the points mentioned in this section. Candidates who are confused about how to download the hall ticket can refer to this section. Here, we have provided the steps to download the admit card for the exam. Initially, go to the official website of the Rajasthan Subordinate and Ministerial Services Selection Board i.e., rsmssb.rajasthan.gov.in. On that home page, go to the admit cards section. By clicking on that section, you will get the list of the to admit cards that are released. Search for the Rajasthan SMSSB Agriculture Supervisor Admit Card 2019 in that list. Click on the link after it is found. Now, fill the required fields by giving the details. Click on the submit button after checking the details. You will the admit card for RSMSSB Agriculture Supervisor Examination 2019. Moreover, carry the admit card to the examination center. Download the hall ticket and carry it to the examination. Also, do not remember to carry the mandatory documents along with the hall ticket. We hope that the information furnished on this page is helpful for your reference. If you have any doubts regarding the Rajasthan SMSSB Agriculture Supervisor Admit Card 2019, you can contact us at freshersnow.com. All the best for all the aspirants. Prepare well for the exam.